One of the latest color trends seen in kitchen design is grey & brown, both neutral colors that work very well together. 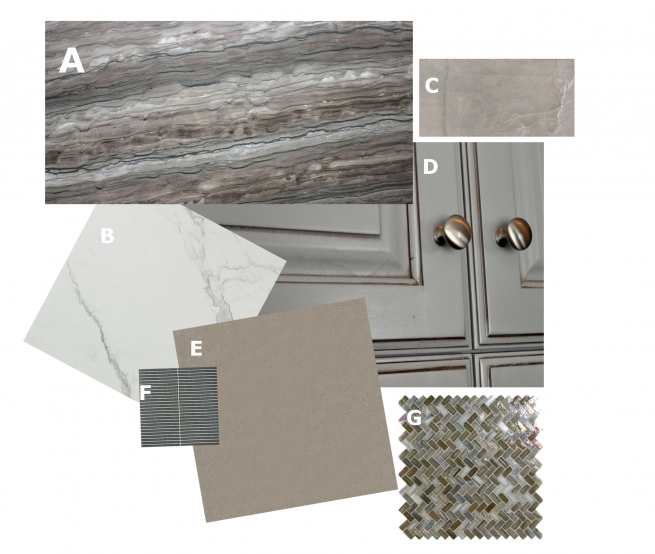 Commonly browns and tans are a go to color for any design, but we have been seeing all shades of grey take center stage. Subtle hints of browns mixed with bolder grey tones makes a calming but bold statement. Grey has become a mainstream color with an abundance of shades to choose from when designing your kitchen surfaces. A. Sequoia Brown Satin Quartzite 2cm, 3cm slab – Beautiful, unique, durable. Quartzite is highly resistant to heat, stains and scratching, making it an ideal choice for vanities and counter tops. B. Marvel – Based on six of the most luxurious and sought-after stones, Marvel adds elegance and refinement to any space. Available in matte and lappato (polished) finishes in four marble and two onyx reproductions, this line is well suited to a wide variety of timeless interiors. C. Stonebox – Stone box is an entirely new concept in porcelain tile design and production. 36 different types of marble, limestone, quartz, and other natural stones were hand selected, photographed in high resolution, and reproduced in a palette of four contemporary colors. D. Kitchen Cabinets – Grey or brown these colors will highlight your new color scheme, be sure to consider the style of the overall kitchen when choosing the type of cabinet doors. E. Parc – An immense series with nine stocked colors, four textures, and a variety of mosaics. With this, Parc can be a versatile base for a palette or an accent in many styles of spaces. G. Marbleized – These mosaic tiles are hand-poured and have a certain amount of variation and variegation of color, tone, shade and size. Additionally, you will notice creases, wrinkles, shivers, waves, bubbles topped off with a natural surface to catch all forms of light for a brilliant effect. These characteristics of natural glass only serve to enhance the final beauty of the installation.